If you reach into Warbler’s sonic crayon box, you’ll find a B3 organ, electric and acoustic guitars, banjo, a gamut of analog synth sounds, and, in their own words, “bells and whistles.” With that many sounds, you’d expect to feel bombarded, but Warbler manages to retain open space within their Neo-folk masterpieces. Warbler’s music is a stylistic roller coaster: plaintive vocals and intricate fingerstyle guitar give way to disco breakdowns, and dark, heavy folk rock suffuses a cosmic soundscape. It’s the music that might materialize if Elliott Smith, The Flaming Lips, and O’death all did lunch. The Oakland four-piece band is ramping up to release a second record this winter. Before hitting the studio, catch Warbler with Oakland's She Beards and Walnut Creek headliners Wave Array on Saturday, Oct. 6 at Bottom of the Hill. 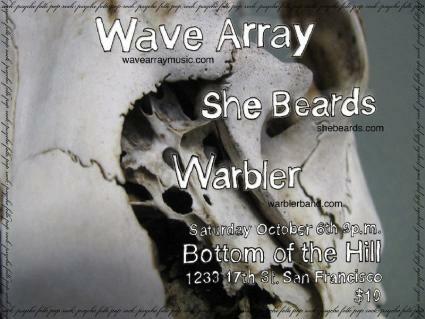 Sadly, this will be Wave Array's last show for an indeterminate amount of time, due to member Storm Lee's move away from the area. Give the band a bon voyage worth remembering.